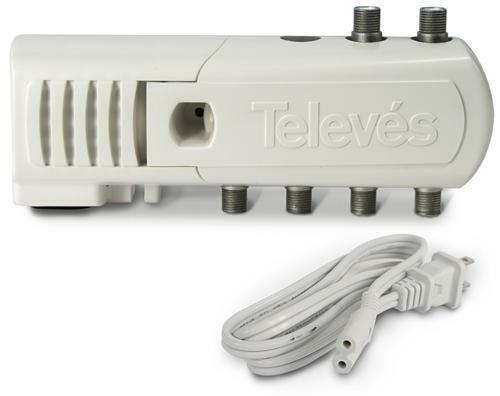 This is Televes’ indoor amplifier. It supports up to 5 TVs with 16dB boost to four of those output ports. (The fifth is for a TV that’s close to the amp.) It’s a top-notch piece of equipment. While it works really well, there’s only one problem. This is the power injector for Televes’ amplified antennas. You wouldn’t be the only one who couldn’t tell it apart from an amplifier. Yes, if you look closely the number of outputs is different. That’s kind of the only way you can tell these near-twins apart, unless you actually had an encyclopedic knowledge of Televes model numbers and product strategies. Look, I know it’s a problem. But really it isn’t. I mean, if you buy an amplified antenna you’re going to get the power injector. If you buy the amplifier you’re going to get the amplifier. The way everything’s packaged at the Televes factory it would be extremely difficult for the wrong thing to get to you. Unless you have both, you don’t have to worry about it. If you do have both, one of them would probably be in a box anyway. The power injector will power three antennas and a mast amplifier, so you wouldn’t need the power injector. The only possible time it could be a problem would be when you actually were hooking everything up, when you had it in your hands. You’d notice that one thing had more outputs than the other thing, so it wouldn’t matter that the pictures look really similar. But, I’ll admit it creates some confusion during the purchasing process, and people do think the white thing is the amplifier in our amplified antennas. The real amplifier is actually within the antenna itself. Televes uses advanced manufacturing techniques that spread out research and development costs among multiple different part ranges. Their plastic molds and metal chassis are used for a wide variety of different parts, making it easier to keep costs down and put money where it needs to be put…. into quality components. In fact the same molds are used over and over for many different parts used throughout the world. Most of the time it’s not a problem. In fact it’s only really a problem when you’re browsing our web site. NICE AND EASY: What does the CE logo mean on electronics?